Hello friends! This is my very favorite time of the year – I call it Porching Season! It is the season that brings the perfect weather for being on the porch – and I love that the porching season here lasts about 6 months! I made a promise to myself during the winter that I would do better about porch sitting when it got warm! I’m not a very good sitter, so it is challenging to me! So today I’d like to welcome you to my home on the hilltop where we can sit and do some serious porching! 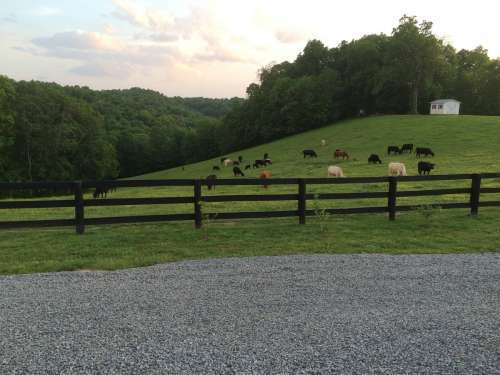 When my husband and I bought our farm here in Tennessee, there was no house on the land. 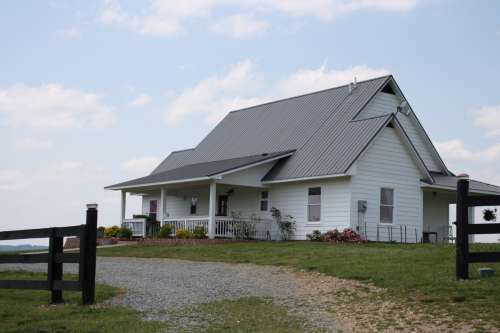 We spent several years (before retiring to our farm) poring over house plans. There was one common denominator in every plan we contemplated… the house had to have a lot of porches. 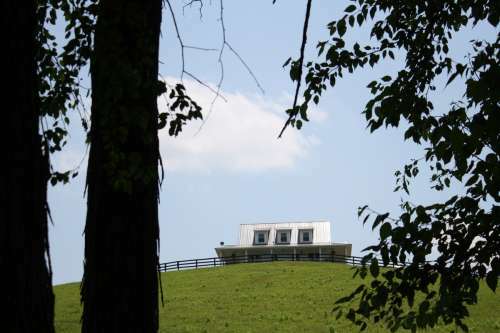 We are so lucky to have a beautiful hilltop that has views every direction you look, so porches on all sides was a must. 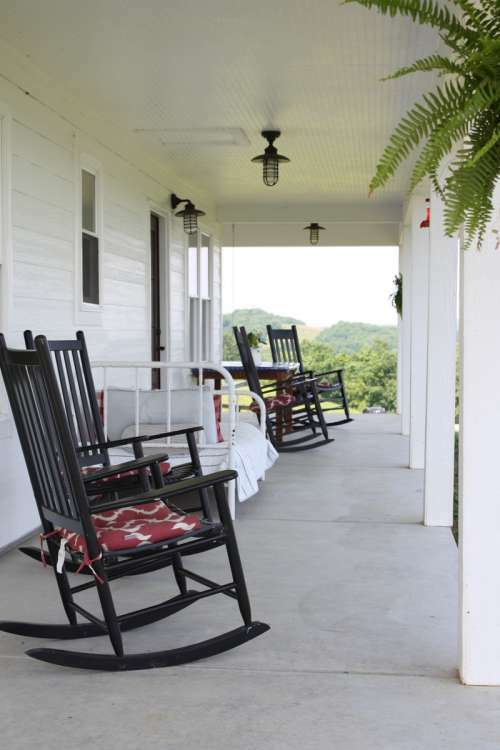 Not long after we finished our home and got everything settled the way I wanted it on the inside, I began to turn my attention to the porches. By that time we had been in the house about 3 months and I became aware of a few very big things to consider in choosing how to furnish our porches. #1: WIND! We have the most amazing breeze on the hilltop. It keeps bugs and humidity to a minimum. But in any kind of a storm that breeze turns to a very heavy wind. The kind of wind that blows things off the porch and down the hill. It was a shock to me the first time it happened. So everything on my porch has to have some weight to it to keep it from taking off down the hill. I do have pillows on my porch bed and on my rocking chairs but those aren’t such a big deal to bring in the house when a storm is coming! #2: SPIDERS! Luckily I am not afraid of spiders. Because spiders love our porches. I have tried numerous things to keep the spiders away and nothing works. I’ve come to the conclusion that the best course of action is my nice old fashioned straw broom and once a week I quickly sweep down the ceiling corners where the spiders like to nest. (You can see them in the above picture!) I’ve gotten very good at it! But with that in mind, I decided very quickly that cluttered porches would just create more places for spider webs! So I’ve kept the furnishings on my porch to a minimum. And this has taken some getting used to, because in my mind I pictured porches full of amazing vintage “junk”! #3: SQUARE FOOTAGE! We wanted lots of porches! Like all the way around the house porches. 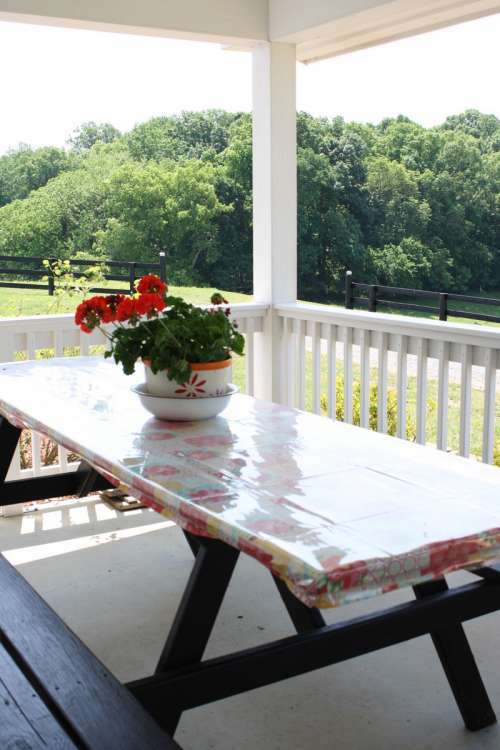 And even though our porches aren’t quite wrap around, they are 900 square feet total. That is a lot of square footage to furnish in a porch! Especially when you take #1 into consideration and everything blows off the hill! So, I have two side porches that kind of sit empty. The above swing is on one of the side porches and that is all I have there. We keep throwing around the idea of enclosing the above side porch and making it an extension off the living room. But for now, the swing is perfect there. With all that said, I love my porches. 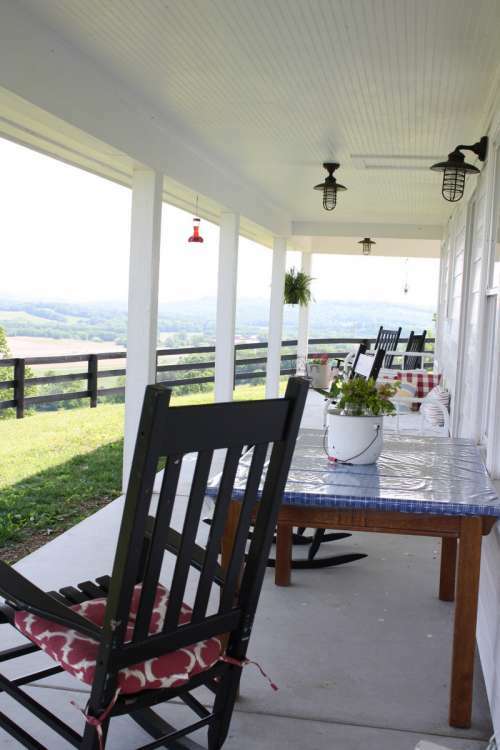 The very long front porch is the one with the best views of the valley below, and there is no better place to watch the sun set. I have an old heavy dining room table on the front porch that I keep a tablecloth on. I have been meaning to paint the table black to match my rockers, but I forgetting. The above picture reminded me! But my favorite thing on the front porch is the old iron bed. I love this bed! The nice thing is that it is a great napping bed, but even better than that it doubles as a kind of couch. I’ve noticed lately that company seems to settle on the bed with their backs against the wall and it makes a super comfortable porching spot! Even though I keep the furniture to a minimum, I have tried to create little areas to sit and visit. The rockers are great comfortable chairs that hold up to the wind! But I have to admit that my back porch is my favorite in a lot of ways. 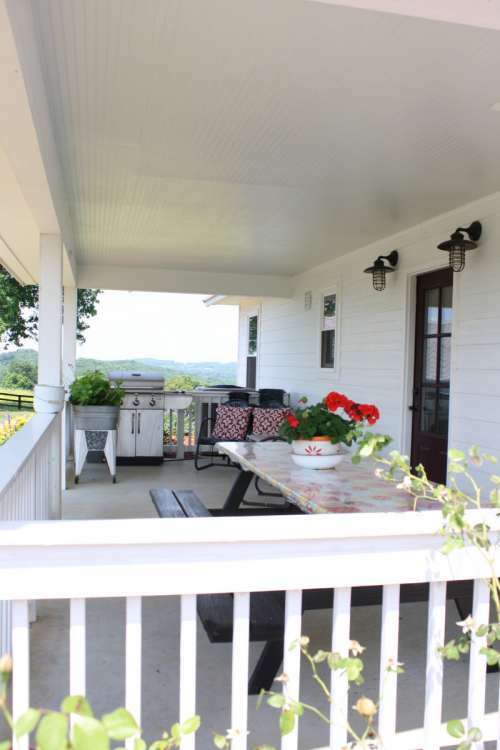 This porch has railing around it to dress it up a bit since it is the part of the house you see when you come up the final hill into the yard. It is quite a bit shorter than the front porch, but it is wider. 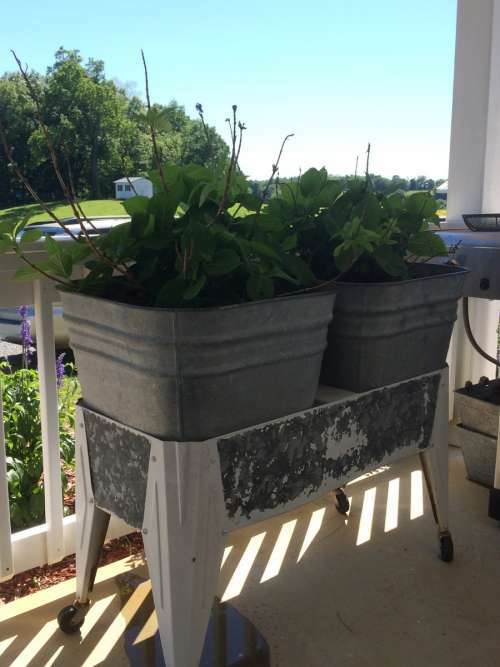 I love my old washtubs that I have Hydrangeas planted in. They are so happy in this location. Just enough sun and water! They’ll be blooming profusely soon! Since the back porch is the door that everyone comes in, I have an old wooden milk crate right next to the door and we drop our shoes and boots here. I’m not an over fussy housekeeper but I do not like farm mud tracked in my house! I’ve trained all my family well! A few years ago a friend gave me this metal bench and matching chair. They had been passed to her many, many years ago and she wanted me to have them. When she gave them to me, there were about 50 coats of different colors of paint and so I took them to a place and had them sand blasted and then I painted them black. I love them! 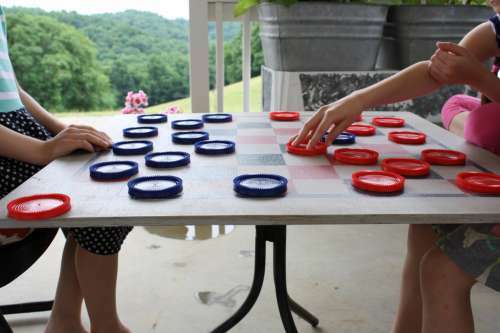 The grand-girls enjoy sitting on the porch and playing checkers on the checkerboard that I made. We also have a corn hole game that my husband built and they play that on one of the side porches. Porches are the best place for playing summer games! I always hesitate to share things about my house. Mainly because, although my house is special to me, it is just a house after all! But because it is porching season, my very favorite season, I wanted to share my porches today. 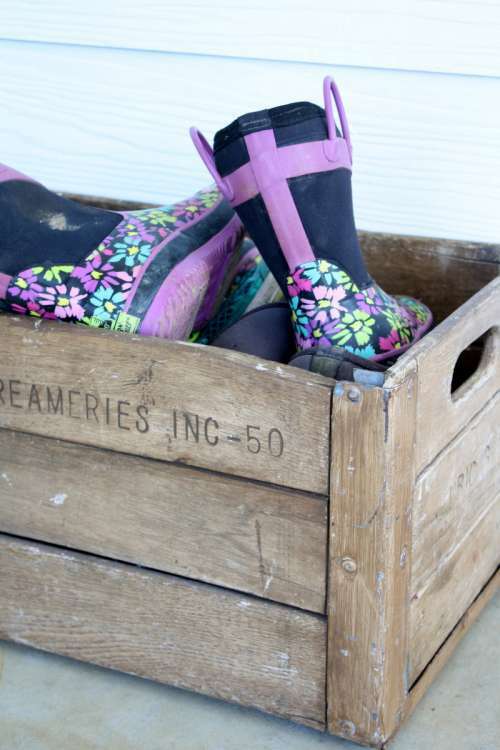 What I wish is that all of my farmgirl friends here in this little corner of the Farmgirl Blog could come over and we could sit and get to know each other better. 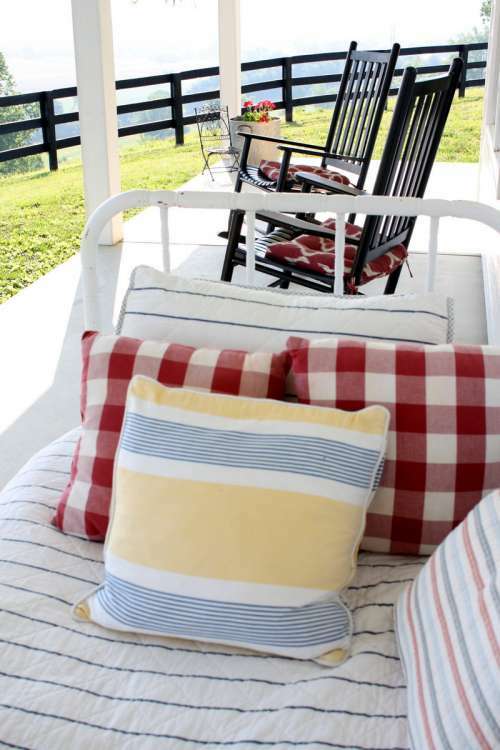 So to close out this post I’m inviting you to pretend you’re here on my porch with me today… and if you were, what is the one thing you would like to talk about? Let me know by leaving me a comment telling me… maybe I can turn your comments into a blog post conversation next month! Let’s get to know each other better! Happy Porching to you dear friends! I just love your porches! I dream of one day having large porches like yours! Our current deck is small, uncovered, and very hot. My little guys love playing on our deck so we use an umbrella to help with the sun and heat. Just the past couple of weeks my husband and I have been talking about remodeling our deck. We would love to make it longer and wider as well as adding a roof covering. No official plans are set in stone, but I’m hoping to get started before the heat of the summer hits! Rocking chairs will also be a must for my deck when it’s finished. Well Dori, I have a feeling we could talk about anything and everything on those porches!! But I bet we’d be doing some hand piecing or hand quilting!! I’d probably fall asleep for a bit on that iron bed, it looks sooooo comfy!! Then we’d of course have to have a snack and I’d beg and plead for some of your homade strawberry shortcake!!! I can just picture it………. Thank you for another trip to the farm!! I don’t care what we talked about! Just sitting and relaxing, drinking tea or coffee, becoming aquainted. Eventually conversation would drift to grandchildren I am sure! And hobbies, and collections, and sewing projects, flea markets, recipes, antiques….friends don’t need topics, it just happens! 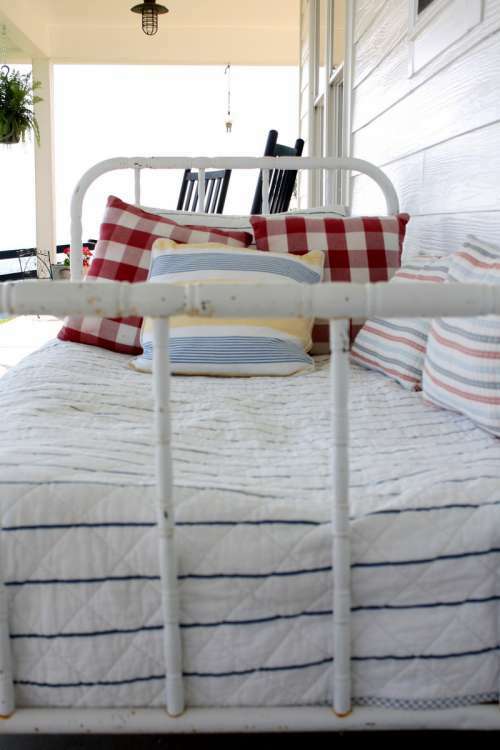 What beautiful porches…the only thing I want to do is have a lovely summer afternoon nap on that comfy looking bed with my cat purring beside me – pure bliss ! I have always loved porches but not always had one, so your post was so enjoyable. I imagine our conversation would touch on how we got where we are, the beautiful valley below your porch, the trout stream in front of mine……..and spiders! I had to laugh about that last one because when we finally got our mountain home with porches the first thing I noticed was how prolific the spiders were; spinning and creating their own art every evening. For some reason I have many more on the front wraparound porch than the back porch. Maybe it is something to do with the wind? Anyway, we would have plenty to talk about. Enjoy your porching season! Dori, I would just sit and relax and admire the view from the back porch, then stroll to the other porches and try them out for a while. I wouldn’t have to talk much, just sit and look and wish I had such a porch. 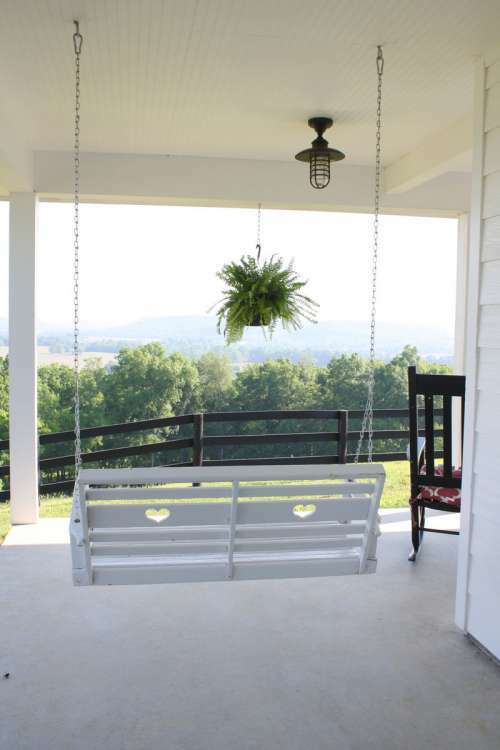 I live in KY and I am still waiting on my home to be done – and we want porches all the way around too, but I will settle for two long ones, front and back, covered of course and with comfortable chairs and a swing. We don’t have much of a view as we live close to neighbors, but I love to look at the night sky and watch for the planes that fly over. A glass of lemonade or iced tea would hit the spot and if you had homemade strawberry shortcake as Kim says, that would be the best way to end a day. I love porches. 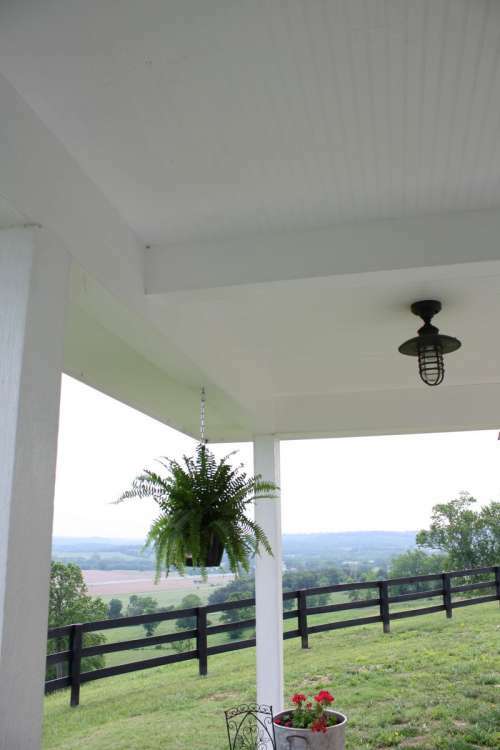 One of my must-haves for our home is ‘the porch’. Thank you for sharing such a wonderful life and the pictures of your home and porches. I feel like I was there for a short time as I read this blog. 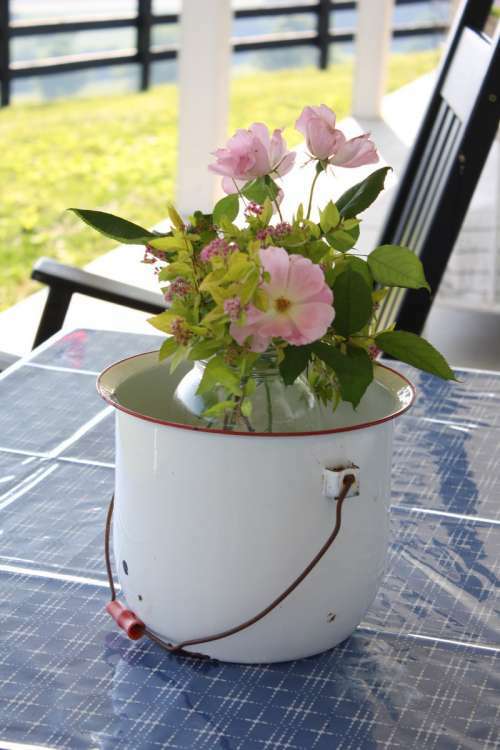 Dori, I also wanted to mention I love what you are using for a flower pot on the porch. I remember those pots very well, as we used one on the farm growing up, and when I lived on a pig farm and took care of the owners pigs. We didn’t have indoor plumbing at either of these places. On my family’s farm, our outhouse was inside the barn which was up the hill in back of our farmhouse and not something we would use at night, hence the pot. On the pig farm the outhouse was below the house and a ways away and no one wanted to walk to it at night either. Those were some happy days though we didn’t have much we had fun all the time. Memories are precious. Dori your porches and the views are beautiful!! Thank you for sharing your porch. As far as the spiders are concerned, have you tried peppermint? I read in a book concerning home remedies that spiders will stay away from peppermint. Have a great time on your lovely porches. I’m a porch sitter too- in fact- I’ve set up my desk on the porch this year. A place to write,- an encouragement of you will. My laptop is here, I wish it was a typewriter, but I have to wait for that gem to be added back into my equipment list. My journal, a cup of tea or maybe a glass of evening wine with a few dogs lulling nearby. My favorite time of year and my favorite space. Dori, you are living my dream with your lovely porch! Thanks for sharing and Thanks for the tour! A lovely post! Your porch reminds me of my grandparents’ house. Spring is my favorite time of year and getting outside on our porches and patios is the main reason why. Porches, beautiful porches! I was raised with porches and always have had at least one my grown up life. Your’s are simple wonderful! I cleaned my front porch today, back porch tomorrow. You know, I think we would have some super conversations about everything from A to Z, especially quilts and quilting. 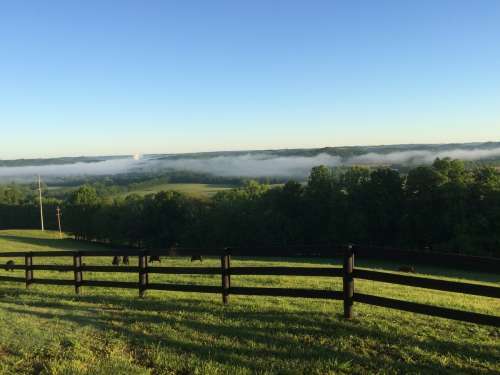 Then just quietly enjoy the special Tennessee air. Thanks for sharing. God bless. Thank you for the invite to sit a while and enjoy your view. Your porches are lovely and I can almost hear the laughter of your grand girls enjoying the games and yummy treats on them. Our Okanagan summers are hot and our porch has no roof only a large maple tree that shades one corner. It has a beautiful view of the lake it’s a favorite way to spend some time each day. Sitting on a porch is just a perfect thing to do on a sunny Sunday afternoon. My farmhouse has a front porch and a back deck. Unfortunately, our house sits close to a road and I don’t like the noise of an occasional vehicle going by, but the back deck is perfect. Our property falls down in the back to a river, so sitting on the deck I feel like I’m in a tree house and listening to the river rush by makes for a perfect afternoon, book in hand, tea on the side table. As a side note, I love when you share your house through blogs, your love for the property signs through, and that’s a wonderful thing to share. Love your porches, I like to sit on my porch early in the morning drinking my coffee , by noon it is too hot to sit on front porch. At your place we could just walk around to the other side. Hey what’s up today? I brought over this new little apron I made this week isn’t it just the cutest thing? I made out of a couple of recycled dresses I got at the local thrift store, I know, don’t they have some of the cutest finds?? It’s so pretty today and sitting on the porch is perfect with these glasses of sweet tea! Let’s just rock and enjoy! 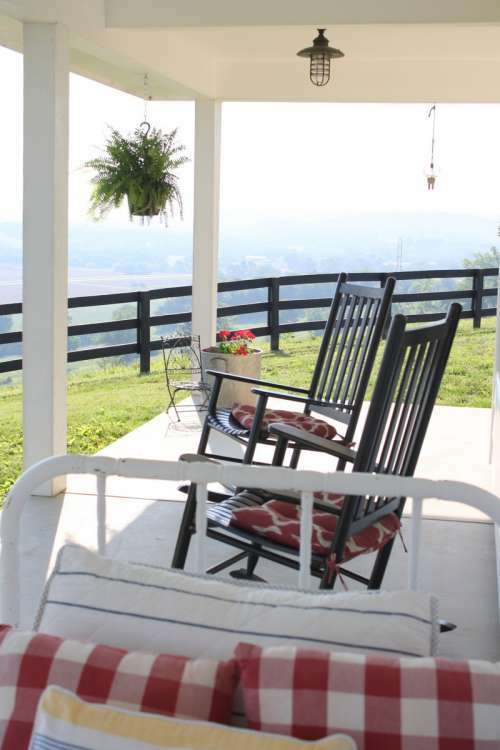 Oh, how I would love to share the view from one of those porches! They are absolutely beautiful. As to what we would talk about, I’m sure we could start with that…. the view. Then we could move on to our projects, past, present and future. Such a lovely place. I love your beautiful porch. . . I love your porches,Dori, they are what I hope to have some day. I have a Verandah on the back of my house and I do ,one to sit out there. 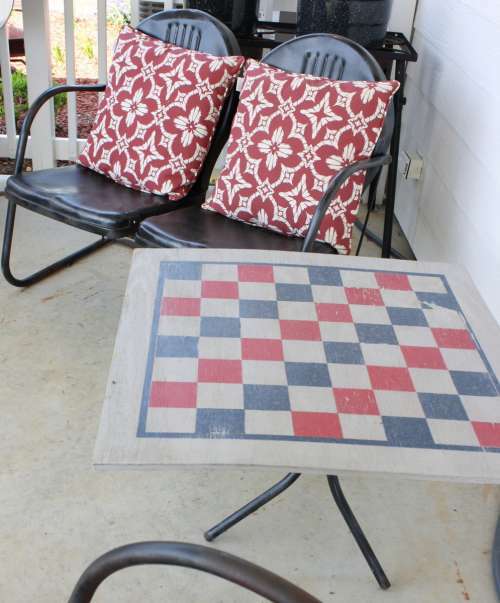 I have a table setting out there and some potted plants and our bbq, but one day on my own porch I’d love to have some rocking chairs, a porch swing and a hammock and a day bed as well as my outdoor table setting and bbq. A real relax place to unwind and treasure time. I’d chat with you about anything and everyone, your favorite plants, life, sewing and whatever else we felt like chatting about, all with home baking, I’d bring some too, and some lovely tea or coffee and later a glass of wine. There’d be no rush to our time together and we’d savor the conversation and time together.